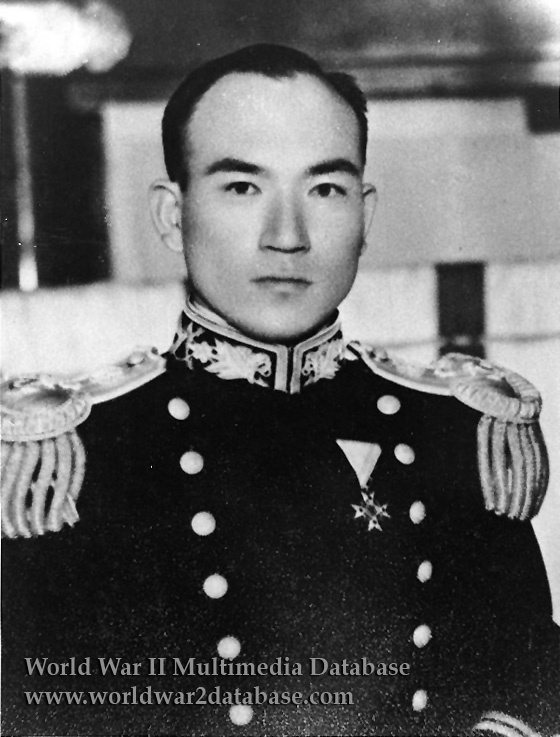 Imperial Japanese Navy Lieutenant Joichi Tomonaga in his dress uniform. Tomonaga commanded the air assault on Midway on June 4, 1942 and radioed Admiral Chuichi Nagumo that a second strike was required to put Midway out of action, despite heavy damage. Later he flew the last strike from IJN Hiryu after the three other carriers of the First Air Fleet had been bombed by US Navy Douglas SBD Dauntlesses. On a one-way mission because of damage to his aircraft and lack of fuel, he successfully dropped his torpedo but was shot down by Lieutenant Commander John S. Thach of Fighting Squadron 3 (VF-3) from USS Yorktown (CV-5). His body was never found; he was symbolically interred in Yasukuni Jinja (Shrine).